21) Swoosh (remix) - Humble 1, Big Fam, M.E. 16| WHAT YOU GOT AGAINST ME? Produced by: Humble 1 | Features: Humble 1, Big Fam, M.E. Project notice was issued in December 2008 to the entire Columbia Basin, directed at contemporaries apparently active in their chosen arts. Intended to spring-board participants based on their level of involvement and contribution, turnout reflected more fresh faces than the well established hip-hop artists of Eastern Washington. 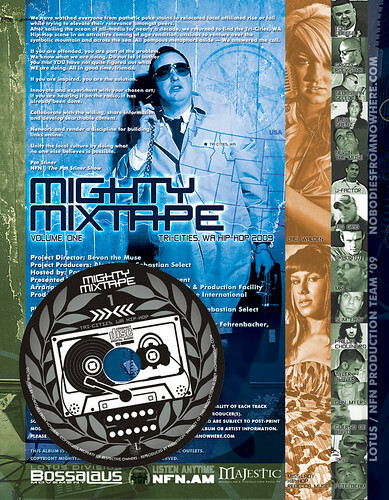 Limited and numbered editions of the physical Mighty Mixtapes were distributed to those deemed necessary to receive them by the participating artists and producers. 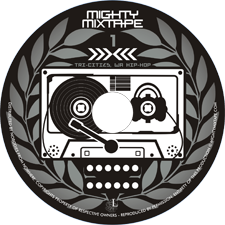 A second run was ordered to accommodate the anticipated release of Mighty Mixtape 2, in which a copy of Mighty Mixtape 1 would be included. Diversity of Tri-Cities area rap is difficult to compare to. While it was often denigrated in the past for imitation of nostolgic west-coast sounds, the active artists of this decade are well versed and experiment across a variety of region-based sounds. Though current pop radio is filled with mindless rap dribble, Tri-Cities Hip-Hop is home to stalwart lyricists and word smiths accompanied by worthy soundtrack providing producers. Innovate and experiment with your chosen art; if you are hearing it on the radio, it has already been done. Collaborate with the willing, share information and develop searchable content. Network and render a discipline for building links online. Unify the local culture by doing what no one else believes is possible.